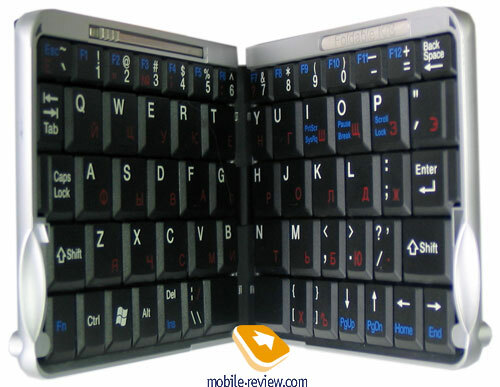 The QWERTY-keyboard can be already built in the PDA. There quite few of them, but ever more built-in keyboards appear in communicators. Even in this case you might need an external keyboard, as all built-in keyboards are designed for two thumbs input method. Manufacturers offer QWERTY-keyboards for some models as extra accessories, but not for many models. The keyboards can be connected by means of IrDA port. It's an interesting solution and a universal one in many aspects, however it requires right position of the infrared port. There are Bluetooth keyboards. 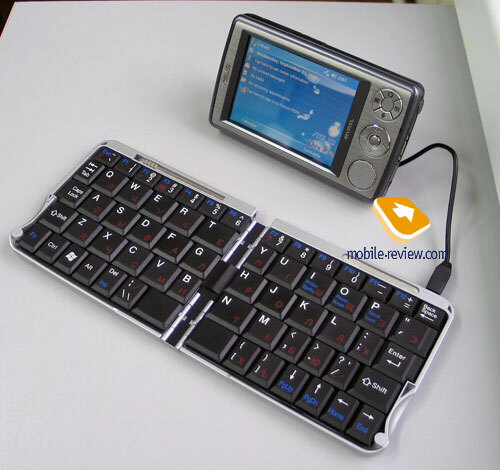 At the first stage the development of Bluetooth keyboards was limited by the high price, the absence of HID profile support on PDAs (users had to plug it via Bluetooth COM port and install necessary drivers) and the need of extra power supply. Now the development is still slow because of the high price and limited number of models, but the positive process is on. There are USB keyboards. 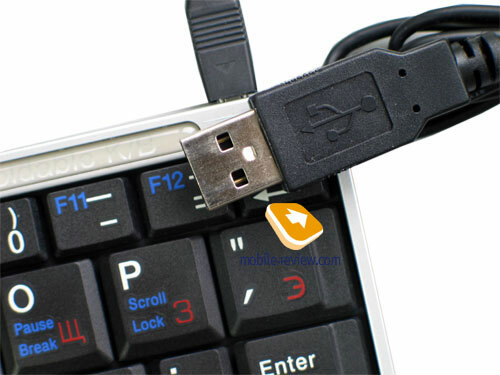 When we talk about external keyboards, we often forget about the way to plug them via USB. There is no wonder, as ordinary USB keyboards are relatively huge and look clumsy with the small PDA - you can't place it in the pocket or take it with you. The list of PDAs supporting USB Host is too short, until recently there were just few models. At the moment the situation is changed. Firstly, there come out really small USB keyboards (our Cherry is among them). 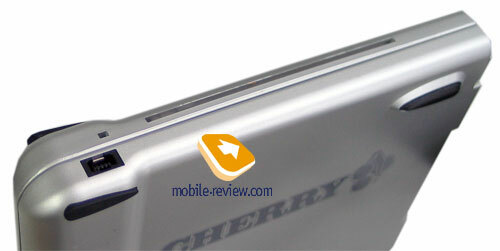 Secondly, ever more new PDAs support USB Host (many new Pocket PC, new keyboard models by Sharp). The keyboard shell is made of silver plastic. When it is folded up, the size is really compact (95x115x14~18 mm), you can put it in the pocket of overcoat or the bag, 160 g of weight won't be a problem for it. When we examined the keyboard, we saw 8 rubber feet, so the keyboard won't slide on the table in the open mode. In the closed mode the keyboard is locked by a magnet and not by a mechanical latch. You open the keyboard easily, after you have to fix it with an iron pin. This fixing is secure, so you can work with the keyboard placed on your knees. But remember that the most comfortable location is on a plane surface. In addition to the keyboard on your knees you have to place somewhere your PDA. 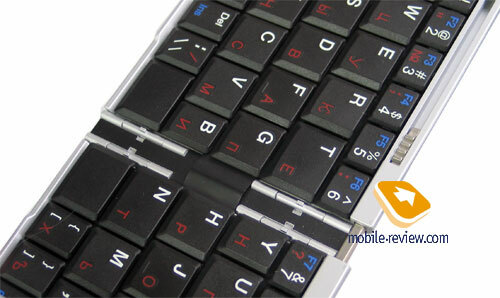 Dimensions in open mode grew to 232x95 mm, the keyboard is very slim - from 7.5 mm to 9.5 mm by sides. This is an advantage against the analogues. The keys are black, the Roman alphabet is depicted in big white letters, and the Cyrillic alphabet - small red letters. The size and keystroke of most buttons coincide with that in notebooks. However there are some nuances, resulted from the tiny size of the whole construction and the keyboard in particular. The top row of functional buttons is absent and replaced with the combination of "Fn" and digital buttons. Auxiliary functional elements (Enter, Shift and so on) have the smallest possible size, some of them simply are absent (Context menu button, right CTRL and ALT). The buttons at the break in the middle got affected: the space bar divided into two parts, "Y" and "B" are half-sized, "T" and "N" on the contrary are bigger than others. There are 63 buttons (2 parts of the space bar stand for one button). You might get impression that it's difficult to use the keyboard, as it's uncomfortable. That's not true, the keyboard area is only 25% less than that in the notebook (for example, Asus S5200N), and frequently used buttons have the same size and feature the same ergonomics as in notebooks. Nevertheless, not completely standard keys layout is the charge for the tiny size. There are no problems to plug the keyboard to the notebook or the Tablet PC (in our case, powered by Windows XP), just do it via USB, that's all. 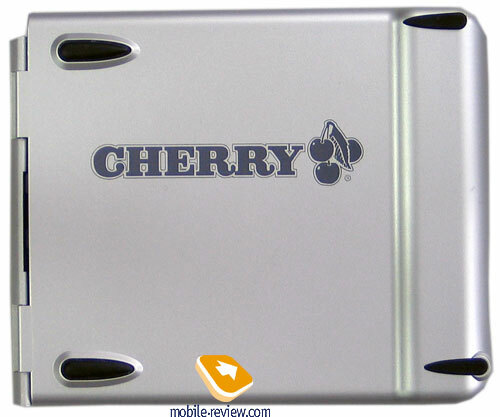 The system automatically detects and installs the keyboard, and then you can enter texts in Roman or Russian letters (in this aspect Cherry Mini Keyboard duplicates the built-in keyboard). However the situation is slightly different with handhelds. The number of models to plug the USB keyboard is limited. But ever more new PDAs have a USB Host, as we've already mentioned. I'd note Acer n30, Acre n300, Asus A730/A730w, Asus A636 (under question, read the review soon), FS LOOX 710/718/720, FS LOOX N500/N520, Rover P7, many Toshiba models, Sharp Zaurus SL-C3100. You can get USB Host in Compact Flash format. With Palm handhelds the keyboard won't work. The keyboard gets recognized and works without drivers, but only with Roman letters. We tested it with FS LOOX 718. The keyboard helped only to enter tests, if you want to carry out other functions with the PDA interface, you should use the stylus pen and the touchscreen. If you need the support of the Cyrillic font, you should use the full russificator by paragon or a freeware program AEKMap. In fact, the input speed gets much higher. If you have time and place, so you can sit and without hurry answer some mail, record a lecture or edit a text of a contract. But you should realize, you'll hardly succeed in typing while in motion, you need to find a plane surface. If you type really fast (touch method with ten fingers), you'll be annoyed to face the following situation: at fast input, when you touch two keys almost simultaneously (with extremely short delay, the second key is pressed, while the first key is not yet loose) the system swallows the first touched symbol. However this is a flaw of the operating system (or built-in driver), but not the keyboard, as there is no such problem with the notebook, for example. With the price tag $35-40 in the US Cherry Mini Keyboard will be good for PDAs with USB Host, its owners need to enter average texts from time to time to the PDA being far from desktop PC. Let's pass to pluses and minuses of this solution. No need to recharge the keyboard or change batteries. Skipping symbols when you enter texts using touch method with ten fingers.